It’s a funny term, often used in professional circles to denote when one’s email inbox has zero messages. As the social media strategist for the Presbyterian Mission Agency, this is one of my most treasured dreams, but not necessarily my reality. I get a flood of emails every day. Out of these, I began to get responses to a project I had begun a few weeks before. Messages of gratitude and love and action started to populate my inbox. (1) What are you grateful for? (2) What do you plan on doing with that gratitude to make your community/church/world a better place? The ethos behind this was to get people thinking about more than just what they are grateful for. Gratitude is great. For Presbyterians, it’s one of the building blocks of our faith. But so is action. How can we use that gratitude — that grace from God — to help others? How can we catalyze on that gratitude? I am thankful for life! 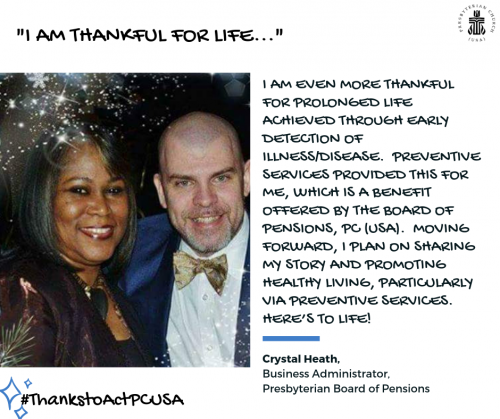 I am even more thankful for prolonged life achieved through early detection of illness/disease. Preventive services provided this for me. I appreciate the benefit of being able to get routine tests performed annually, which this company supports strongly. During a routine annual mammogram, I was diagnosed with an early stage of breast cancer. Had this gone undetected and untreated, I may not be here today to tell about it. I am now a catalyst for preventive services. It is one thing to answer questions regarding preventative services, but it’s another to answer the (denomination’s) Call to Health … to be proactive in one’s own wellness is essential. Knowledge is power! Pay it forward and encourage those around you … on the job, in your home, at your church, wherever you go! Wopida Tanka to Wakan Tanka who is all powerful, ever present and all knowing. I am thankful for the great love our creator has for all of his creation. I am thankful for our Savior, Jesus, who one day revealed himself to me in love and set me free from hopelessness. I am thankful that I have the Holy Spirit that gives me the ability to love and guides me through life. I am especially thankful that the Holy Spirit connects me to Wakan Tanka, our Creator, in such a personal way that I can feel it is right and good and know without a doubt that He is Truth. I am thankful that I can be a witness to the love of Creator to my own people. I am thankful that Wakan Tanka has a plan and I am in it. This is the greatest thing I can do as a human being and that is to love the Lord my God with all my heart, with all my mind and with all my soul. When I think of being thankful it always starts with God because without his great love for me, I would be lost, unhappy and have nothing to be thankful for. Wopida Tanka! Since embarking on this project, checking emails has become a little less monotonous. Now, as I go through them, I’ve found myself flooded with waves of — what else? — gratitude. Gratitude for the stories that are being so generously shared with our news team. Gratitude for the work that people are doing in their communities. Gratitude for the people who make the Presbyterian Church (U.S.A.) an organization I am proud (and grateful) to work for. I invite you to share what you are grateful for. 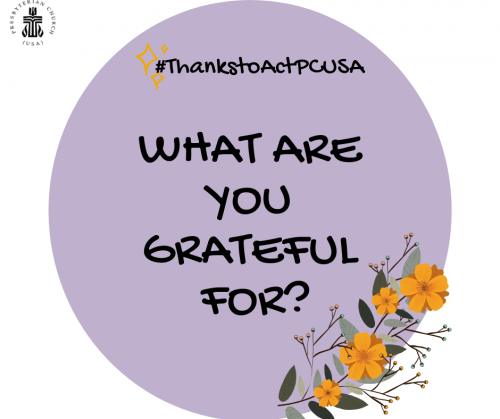 On social media, tag us in your responses or use the hashtag #thankstoactpcusa to be featured next. Follow the Presbyterian Church (U.S.A.) on Facebook or Instagram by following @pcusa, and on Twitter @presbyterian. Holy God, you call us from every time and place to follow you. Give us the courage to go where you lead us and to ask daily, “What can I add to the body of Christ?” Help us to hear your call and respond faithfully, so that we may each grow in our relationship with you. Amen.